Everyone's favorite Caldecott Honor-winning porcine diva is back and with fanfare! There are going to be fireworks tonight, and Olivia can hardly wait to hear the band. But when she finds out that there isn't going to be a band, she can't understand why not. How can there be fireworks without a band?! And so Olivia sets to putting a band together herself...all by herself. 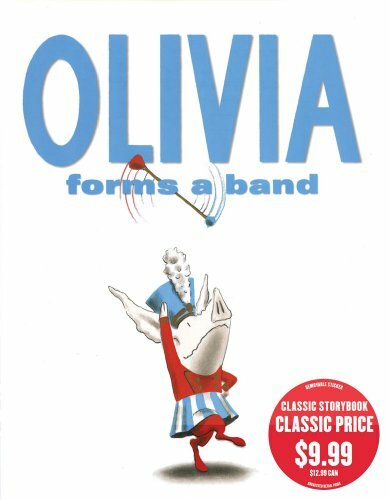 Using pots, pans, her brother's toys, and even her father's suspenders, Olivia forms a band spectacular enough to startle any audience. Lavishly brought to life in Ian Falconer's signature style, and introducing an eye-catching shade of blue, here is Olivia doing what Olivia does best -- making noise. Ian Falconer is the author and illustrator of all the titles in the bestselling Olivia series: Olivia, Olivia Saves the Circus, Olivia...and the Missing Toy, Olivia Forms a Band, Olivia Helps with Christmas, and Olivia Goes to Venice. His illustrations have also graced many covers of the New Yorker. In addition, he has designed sets and costumes for the New York City Ballet, the San Francisco Opera, and the Royal Opera House (Covent Garden), among others. Mr. Falconer lives in New York City.